I'm officially an international artist! My jewelry has crossed the seas arriving Nov 1st to be included in a really cool jewelry show in Scotland ! I'm totally jazzed. http://www.touchedbyscotland.com/2012winter.php . What a journey this was, learning to adapt to customs requirements for the United Kingdom and the time spent on the phone gauging what I could and could not ship via UPS and all the restrictions! Apparently spent bullet shells are a NO NO, so I had to hold back some very cool and striking jewelry pieces. Live and learn, but after much hoop jumping, the work made it there safe and sound and just in time to put on display for the opening. Jenni was simply "brilliant" to work with (as I thoroughly enjoyed her sweet jovial accent) and I really appreciated the invite to such a cool show. Robin, one of the super friendly owners, extended this invitation to me so I could be a "little ol' representative" of the U.S. since she is originally from here and come to find out has been seeing my work for quite some time and thought it would be a unique fit for Scotland since she hasn't seen anything like it. I was tickled at the invite and excited by the representation in the beautiful small village of Oyne in rural Aberdeenshire! I can't wait to make a future journey to this contemporary gallery and explore Scotland. Now, where'd I put my kilt and bagpipe? Jewelry Tins are In! I put together the cutest little tins of jewelry for the holiday shoppers and just delivered them to the Manhattan Golf & Gallery at 50 North Centre Street in Cumberland, Maryland (301-777-0021). The sets include a necklace and coordinating earrings and are creatively displayed and hand wrapped in the most adorable tins. It is such a fabulous gift or stocking stuffer. You can even slide a hook through the round tin bow and hang it on your tree for her to find! Limited quantities are available so drop in and grab one soon. That being said, did you ever wonder what goes into the packaging process of a professional but independent artist? It can be a task sometimes for sure. For instance, not only do I make the product, but then I have to come up with some creative ideas for display, especially for the stores I sell in. I found myself sitting on the floor half asleep a couple nights ago as I prepared these particular jewelry tins. After ordering the tins, I had to design the inserts without a team of company helpers like the big boys. You simply can't find companies that already pre-make the inserts - believe me, I checked thoroughly. gather other tools: glue, wire, hole punch, foam, etc. wait, what time is it???? it's that late?!!! Now how do I display them in the store? Being a bit of a collector of stuff (aka mini horder) I found some metal brackets. Then stacked them into an old antique drawer. Then take some pictures. And wha la, cute as cute can be and ready for sale! One of my favorite artists and friend, Jean Barnes Downs http://solitudestudio.com/, and I went on a ROAD TRIP to drop off art & jewelry product to Gifts Inn Boonsboro in Boonsboro, Maryland yesterday. We talked happily along the drive about our art, my new industrial bohemian jewelry line that I was taking to store, and her upcoming Artist in Residence trip to Mesa Verde National Park in Colorado that will allow her to explore the park to gain inspiration for her future work. 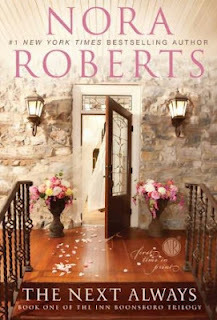 The first two books of her trilogy are titled "The Next Always" & "The Last Boyfriend". 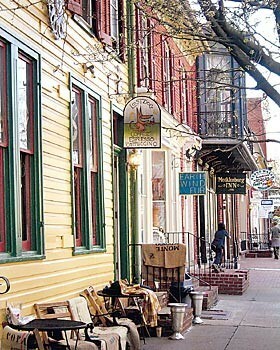 They are based in this quaint rural town which is nestled at the foot of South Mountain, between Hagerstown and Frederick. Founded in 1792 by George and William Boone, cousins of Daniel Boone, Boonsboro forms a gateway to relevant colonial and Civil War heritage sites including Washington Monument State Park, South Mountain, and Antietam National Battlefield. Boonsboro is also the home to the Inn BoonsBoro - a beautifully restored historic bed-and-breakfast located on the square, also owned by Nora. 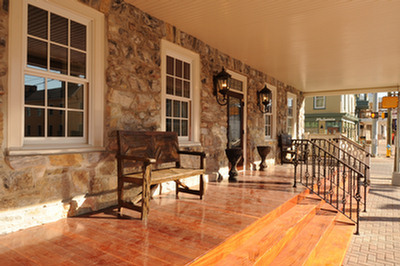 The Inn BoonsBoro's front porch looks very inviting! Next on our trip was to linger in the nearby Shepherdstown, Maryland where we had a yummy lunch, some shopping at another art store and who could pass up a coffee at the very artsy Lost Dog Coffee shop! There is always new art on the walls and this was a pretty fun installation hanging. I loved what looked like burlap coffee bags as cushions for your hiney! If the walls don't get your artsy side juicing, then you just take a quick trip to the bathroom and soak in the wackiness. No reading material needed as you exit out all that java you just took in. Sometimes I think this is what too much caffeine makes you see! It all makes you feel so fun & bubbly inside. 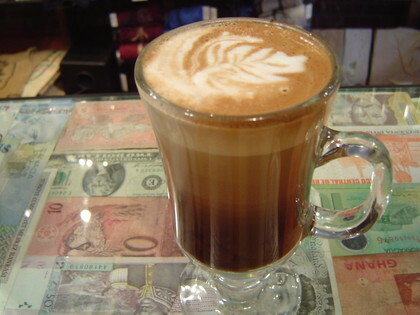 But we weren't able to linger because Jean had to get home to begin her packing for her trip so we decided to take our fabulous java concoctions on the road, heading into the rain and home to the western mountains of Maryland. I don't know if it was the many shots of espresso in our drinks, but we gabbed incessantly the entire way home! I'm so excited, I now have a new Cumberland Maryland location for my jewelry! I just installed this jewelry today at the Manhattan Golf & Gallery on 50 N. Centre Street! They are revamping the space and are representing me as their sole "jeweler". They also have some really fun 2D artwork, do matting & can fit you for golf clubs! They have some fun and great contemporary painters that they are also representing. I took almost 50 pieces today and there will be a ton more to come over the next month and beyond! 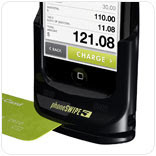 Don't be afraid of it - Mobile payment processing of your credit card at my festivals! Have you found yourself at a festival wondering how safe it is to hand over your credit card and/or have it swiped or hand-keyed into the new technology such as a smartphone or iPad? It's ok for you to ask us how this works! It's better for you as a customer, here is why: It is an application, usually by a large credit card processing company and it DOES NOT let the smartphones store any credit card or personal info, the info is encryped and immediately sent to the payment processing company, JUST like when you use a credit card in a store! In my processing company's case, it won't even store your email on my iPhone. We can email you a receipt immediately and we don't see the email address after it processes! As a business owner, I like that I do not walk away with YOUR info and the only time I see your credit card is when I am swiping it! It is more secure for you and I don't have to be responsible for safeguarding your card information! Only draw back is if I don't have cell service, then we have to do it the good ol' knuckle buster by-hand way! So, if you find yourself at a festival where an artist asks for your credit card info to put either in their smartphone or iPad, it's all good! Technology and companies out there have finally caught up with our "traveling businesses" and realize we need safer ways to safe guard our customers! Come on out to Lakeview Golf Resort & Spa in Morgantown WV and visit Macee at the Artisan Marketplace during their 28th Annual Festival of Food & Wine. The Artisan Marketplace will be open on Saturday, January 21st from 10-6. All other food and wine activities start Friday and continue through Sunday. You can come out for the day or jump on their Getaway Package. This years event features "A Culinary Road Trip Across America". 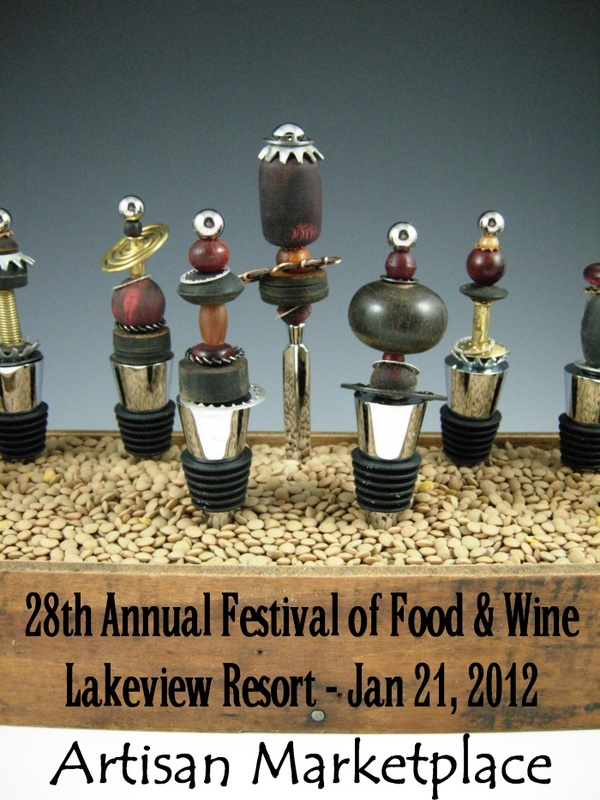 Find the details at http://www.lakeviewresort.com/media/docs/FOFWebFlier.pdf . Check out their food & wine schedule here http://www.lakeviewresort.com/media/docs/2011FestivalofFoodschedule.pdf and of course you must see their menu for the weekend here http://www.lakeviewresort.com/media/docs/FOFMenuList125.pdf . YUM! And finally, reservations and direction can be found here http://www.lakeviewresort.com/west-virginia-vacation/index.cfm . Come say hi and enjoy and fabulous weekend! Maybe even book a Spa treatment!